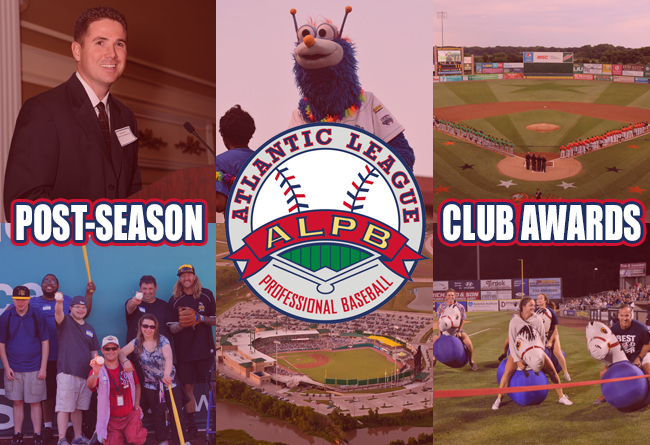 (Lancaster, Pa., Oct. 15, 2018) – The Atlantic League of Professional Baseball (ALPB) today announced its 2018 Post-Season Administrative/Community Honors, including special recognitions for team accomplishments both on and off the field. Winners were selected through voting from league club managers and executives. For the second consecutive season, the Somerset Patriots received the Ken Shepard Award for Promotional Excellence. Throughout the year, Somerset continuously showcased extensive and innovative marketing strategies through their use of social media, video content and their mobile app. Their presence on social media accounts remains consistently strong and highly interactive with fans. Additionally, their nightly on-field promotions at TD Bank Ballpark rank among the best in baseball. Patriots President/General Manager Patrick McVerry was also honored as the Joe Klein Executive of the Year. In addition to overseeing the outstanding work of the Somerset Patriots front office staff, he helped put together a team that posted a 72-54 overall record in 2018. In addition, the club claimed its sixth consecutive postseason berth as the first half Liberty Division champions. The Sugar Land Skeeters also took home two club honors in 2018. Constellation Field was named the Atlantic League's Ballpark of the Year. After serving as a shelter a year ago in the wake of Hurricane Harvey, the ballpark this year saw the opening of the brand-new Sport Court of Texas. The area, located beyond the left-center field fence, featured two basketball hoops along with a state-of-the-art Sport Court playing surface that provides active fans with a safe and enjoyable experience. This, along with the many other amenities featured at Constellation Field, have helped make it one of the premier ballparks in minor league baseball. Additionally, the Skeeters claimed the Ray Cipperly Award for Groundskeeping Excellence. Team Head Groundskeeper Brad Detmore, Assistant Groundskeeper Robert Croteau and the entire grounds crew kept the playing surface at Constellation Field in superior condition all season long in the wake of various operating circumstances. These included weather, field traffic, financial resources and non-baseball event impact on the playing surface. The Long Island Ducks have received the 2018 Promotion of the Year Award. This season saw the Ducks play host to the Atlantic League All-Star Game, presented by Good Samaritan Hospital Medical Center, which returned to Long Island for the third time in club history. The event exemplified the professionalism, creativity and class of the Atlantic League. VIPs were treated to a traditional Long Island clam and lobster bake dinner at the Team Destroyer All-Star On Deck Party, while fans at Bethpage Ballpark enjoyed the pre-game Digmi Home Run Derby and one of the most exciting All-Star Games in league history. The Liberty Division earned a 4-3 victory over the Freedom Division on a walk-off ninth inning single by Somerset’s Alfredo Rodriguez, who was named the All-Star Game Most Valuable Player. The New Britain Bees have garnered the Outstanding Club Community Service Award. During the 2018 season, the Bees partnered with the Beautiful Lives Project to give disabled participants the opportunity to play ball on the field at New Britain Stadium with Bees players and coaches. These events were hosted by the Bees once a month. The Beautiful Lives Project provides people with disabilities the opportunity to actively participate in activities and events that may not have been available to them previously due to physical or facility limitations. They work with communities, organizations, groups, and individuals to create, build, and expand immersive and enriching experiences for all participants. To learn more about the Beautiful Lives Project, visit www.beautifullives.org/. Finally, Southern Maryland Blue Crabs mascot Pinch has been named the Mascot of the Year. Pinch attended a franchise-record 200 community appearances during the 2018 season. Additionally, he remained part of the Blue Crabs’ goodwill, standing and cheering on the dugout during many hard-fought games this past season. Pinch’s winning personality reinforced positive fan energy at Regency Furniture Stadium and spread that same excitement for Blue Crabs baseball throughout Southern Maryland throughout the year. To view all of this year's Post-Season Awards, please CLICK HERE.